The infrared light spectrum has proven to be an area with great potential for snow science. Most of the work performed to date has been to understand the optical properties of snow and often is convoluted by terms that are not easily understood. Consequently, the research regarding infrared light in snow science is not readily available to practitioners. This work demonstrates that not only does the infrared light spectrum have value in the scientific community but also as a practical tool for avalanche risk assessment. In an attempt to make this technology more available, the last two winters have been spent developing a practical tool that makes use of infrared light analysis in the snowpack. Initial results show that the device provides qualitative relationships to observations made in snow pits. Near infrared (NIR) light and its interaction with snow is an area of research that has been slowly developing since the 1980s. However, the past decade has seen NIR developing much more quickly as a legitimate tool for snow science. For example, Matzl and Schneebeli (2006) used NIR to characterize the specific surface area (SSA) of layers in an open snow-pit using digital photography. Painter et al. (2007) built off of what Schneebly and Matzl did by creating an illumination probe to give them optical-equivalent grain size. Additionally, Picard et al. (2009) studied the effect of grain shape on the SSA derived by albedo. Finally, Langlois et al. (2010) also created NIR images of a snow pit wall in order to compare traditional snow grain morphology parameters to those estimated by NIR. All of these studies have made significant advancements toward quickly analyzing a snowpack, however their findings have yet to make it to practitioners. In order to build off of this research in a direction that will enable practitioners to take advantage of these findings, a platform is needed that can be easily used in the field. The initial attempt at this platform is a probe that creates a NIR light profile while being pushed through the snowpack. These readings can be used to show the stratigraphy of the snowpack without having to isolate a full snowpit wall. In order to obtain stratigraphic information using portable NIR technology, a probe was designed to continuously measure NIR reflectance while being inserted into a snowpack. For this work, a 120cm probe was used. The NIR technology was placed in the tip of the probe with the emitters and sensors pointed laterally to the line of motion that the device is operated. This allows the readings to be taken as if they were against a pit wall. The device has enclosed the necessary circuitry in a water proof handle at the opposite end of the sensors. The probe is operated by activating a reading, and inserting the probe into the snow. The apparatus is collapsible and currently connects to a laptop via USB cable. While it is recognized that a computer and USB cable connection is cumbersome for a practitioner, this prototype was intended as a proof of concept for the proposed platform. The testing was primarily performed in Idaho, with one occasion in Eastern Oregon. The device was tested next to 18 snow pits on 15 different days across 7 different mountains. In order to find a spot for testing, a slope was chosen in the same fashion that an avalanche pit on a day of touring is selected (an open representative slope). Being that the steepness of the slope is not important when assessing the structure of the snowpack (Birkeland et al. (2010)), low angle slopes were generally chosen for the safety of the testers. The angle of the testing sites were not recorded. Once a site was chosen, a snowpit was dug, and a hand hardness profile taken. The pits ranged in depth based on the location. The smallest was 76cm dug to the ground. Deeper pits were rarely dug over 120cm. The probe itself was 120cm, so for comparison purposes it was not necessary to dig any deeper. The hand hardness was taken using roughly five pounds of pressure at a time while wearing a thin liner glove. For consistency the same person was in charge of creating the hand hardness profile for all but one occasion. The depth was generally recorded in the snow height format, where zero is the ground, counting up to the top layer of snow. After the hand profile was recorded, any layers that stood out were further analyzed via crystal cards and pictures of the layer within the snowpack. After all observations were completed, the probe was then used. The readings were taken in a grid pattern in the undisturbed snow by the snow pit wall with the sensors facing away from the open pit. The first reading was taken closest to the wall, moving laterally and outward as more readings were taken. Roughly 10 readings were taken at each snowpit and each successive reading was 10-15cm away from one another. Individual probe readings were performed in a two person group. One person to operate the laptop and the other to operate the probe. With the probe completely out of the snow, the person on the computer would begin the recording software and then tell the person on the probe to insert the probe into the snowpack. Once the probe had been plunged fully into the snow, the computer operator was informed to stop and the recording was ended. Probings were usually done at a speed such that each reading lasted about 1 second. 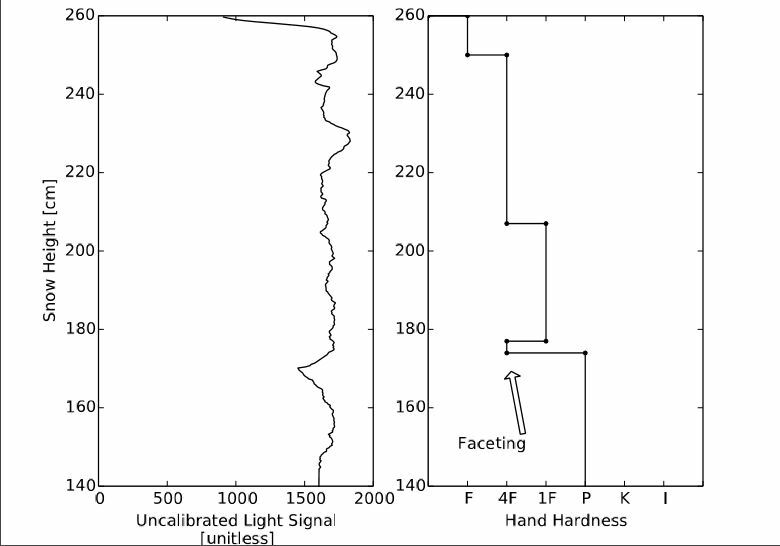 The probe was then removed from the snow and the data visualized and compared to the hand hardness profile taken in the pit. Visualizing this data was simply done by creating a line graph of the raw data. These graphs were designed in a similar manner as a traditional hand profile for easy comparison. In this case the X-axis is the uncalibrated value which is related to reflectance and the Y-axis is assumed depth. The data that was generated is originally recorded as a function of time, thus each reading takes on a depth profile determined by the number of data points and the final depth. Each point was assumed to be equally spaced across the final depth of the probing, which is assumed to be 120cm unless otherwise noted. The readings taken with the probe resulted in purely raw digital conversions of the sensor values that are related to the NIR reflectance seen by the probe. The numbers are currently unitless and simply meant to be used for comparison. Although a single data point currently has little meaning alone, the data as a whole can be compared to the hand hardness profiles created by the tester. When comparing to the hand drawn profiles, crusts and facets were of the most pronounced features measured during this study. Often both of these features were identified in the hand profile and thus provided a solid point for comparison. One unique factor about the crusts, other than the positive spike from the crust itself, were the inverse spikes found directly above and/or below. This is believed to be visualization of faceting, according to literature faceting tends to develop at the interface of a crust with regular layers (e.g. Colbeck and Jamieson (2001)). Although faceting at the interfaces of crusts is often too thin to note in a hand profile, it appears as though the probe readings were able to easily pick up these layers. Figure 2 shows at 110cm a thin crust was detected, here the crust itself is pronounced with an even more pronounced decrease following it right after. Interestingly at 70cm-90cm, another section of the reading is bordered by notable decreases in the reading. This may be the crust shown at 80cm in the hand profile. Though the probe reading identified the crust as 20cm thick and the hand profile identified it as 5cm thick, this discrepancy could be explained by a stretching of data if the user slowed down during the reading. Since the depth is assumed, such time related artifacts would be present in the readings. The probe was also able to detect faceting alone in the snowpack which is shown around 175cm in figure 1. This confirmed suspicions that the probe is particularly sensitive to facets in the snowpack even when not near a crust. An interesting detail is the shape the facet layers have in the probe reading versus the hand profiles. In figure 1 there is a distinguishing “v” shape to the layer which is not shown in the hand profile, suggesting a natural transition to the different snow. This is to be expected because the vapor gradients required to develop such layers will never be discontinuous. This same “v” shape can be identified at the interface of both crusts in figure 2. It should be noted here that the use of the hand profiles was purely for comparison and is not meant to suggest that there is a direct link between these probe readings and snow hardness. This is corroborated by literature where there has not yet been any direct relationships demonstrated. What can be drawn from this work is that the probe appears to be detecting faceting, which can cause instabilities in the snowpack. An obvious limitation of the device was ease of use. While an individual reading can be taken relatively quick compared to other assessment techniques, the current apparatus required a laptop and two users. The probe was equipped with capability to communicate wirelessly with a mobile phone but due to unexpected delays and time constraints, a corresponding app was not completed. This resulted in a relatively small data set. This study is pulling from only 18 snow pits, totaling 119 readings, and all the work was performed in an intercontinental snowpack. In an attempt to expand the data set, this study was originally planned with multiple people testing the probe via the mobile app to lower the time to data and persons required for deployment. This method does reasonably well in this case resulting in a final depth of 89cm. For these readings the operator attempted to insert the probe to 85cm. This was done because it was performed during spring time in a shallow snowpack, so 85cm was chosen as a means to avoid ground strikes and underlying brush. This is also how deep the pit was dug. As mentioned, the point selection was performed by observation, which proved impractical for numerous readings. Attempts were made to automate the process but none of the algorithms selected/created proved to be reliable. This area is still being researched and extra hardware is being investigated to improve the accuracy of the depth. Calculating the depth as a function of time is paramount because even the same user operates the device at different velocities as snow conditions vary. This effect was initially considered to be fairly negligible as long as a decent approximation was made on the average velocity. However, depending on the speed at which the probe is inserted at any given moment, the readings can be stretched and shrunken in time. Having an accurate depth profile improves the consistency of interpretation of the snowpack and minimizes the time artifacts. This is best demonstrated by figure 5, which shows the same reading as a function of the calculated depth versus an assumed depth that was evenly distributed across the depth of the snow pit (85cm). In some areas there are 5-10cm of discrepancy. This data was taken in a relatively homogeneous snowpack so there was not much in the snow that would cause a user to slow down or speed up. Despite the convenience of a “nice” snowpack there was still notable stretching and shrinking. In snowpacks with multiple crusts there is a great deal more of the time artifact demonstrated. This made the data analysis more subjective as there was no way to prove that an identified layer was indeed at the same depth between the hand profile and the probe reading. This also made it difficult to judge consistency, as different features would occasionally change relative shape due to stretching and shrinking. Although they were generally still identifiable, this again made it difficult to draw conclusions while analyzing data. In an attempt to create a platform that brings the NIR technology being used by snow scientists to practitioners, a NIR light emitting and receiving probe was prototyped. During its testing, two snowpack features were consistently identified, which were crusts and faceting. In particular the probe detected faceting with notable sensitivity. The shape of the facet layers proved to be recognizable and may have the potential for further characterization. For the probe to further bridge this gap, the depth sensing and the wireless communication ability must be resolved. These issues are currently being corrected in preparation for a follow up study planned for the 2016/2017 winter.